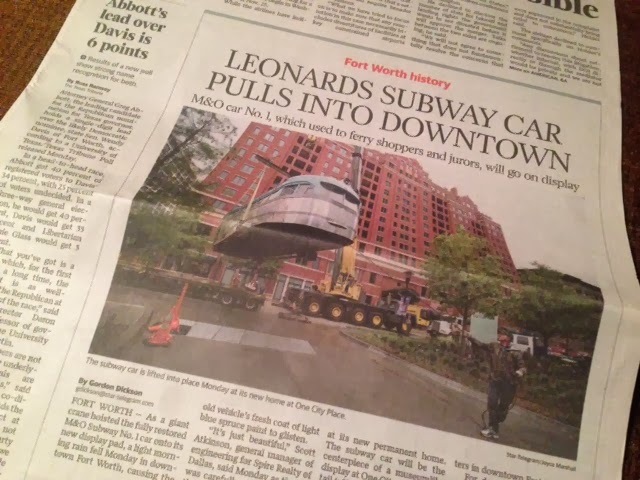 The story was about the old subway that ran from the Henderson parking lot to the former Tandy Center. Just reading about the long-forgotten subway line reminded me of my pregnant self riding that old car to report for jury duty, praying I wouldn't throw up on the judge. My reminiscing seemed timely because recent visits to downtown Fort Worth have made me a little wistful for the old Tandy Center ice rink there, not to mention the Christmas tree lights that adorned each of the two Tandy buildings. It occurred to me that if I get nostalgic for the Fort Worth of yesteryear, it must be really rough for the "Old Timers." And with that thought, I assessed my own standing as a DFW resident. If someone were to ask me where I live, I'd tell them Fort Worth, but to this day, I consider myself a newcomer. And that's after 22 years here! It's strange to think I've lived here longer than anywhere else: longer than my 13 years in Tyler, much longer than my five rather formative years spent in Austin. So why do I feel like such a n00b in my own hometown? Maybe it's because so many of my friends and colleagues in the Mid-Cities have lived here since birth. They have at least twice as many years here, which means they have much more extensive Fort Worth expertise. They remember the fast food joints that were on Pipeline, the stores that used to fill Northeast Mall. They know the quickest route from A to B in traffic, in bad weather, or during Mayfest. In many respects, I'm a Fort Worth virgin. I STILL haven't tried all the downtown eateries. I STILL don't know all the shortcuts to get around TCU or the hospital district. And if you ask me who is the best doctor/dentist/mechanic, I'm going to have to hit up Google. I guess I should be thankful for the Tarrant County history that DOES overlap my own. The BankOne building's plight from tornado-ravaged to eyesore to repurposed offices and condos. The long gone North Hills Mall on Highway 26, the shopping center with the holiday train and the REAL Santa every year. The Good Eats Cafe that was replaced by Mexican Inn. And how about Italian Inn with the private booths (with wooden doors!) and singing waiters? And Mi Rae's? And Harrigan's, before and after the fire? And Lil' Things? Regardless, I'm most grateful for all my neighbors, old and new, who have made living here such a blessing: the friends and colleagues who became my family when I moved here, fresh out of college, in 1991. The city itself may still seem a little foreign to me, but thanks to the precious people who make this place a community, I'm proud to call Fort Worth HOME.